In a program that spans more than 30 years, the Parents' Association sponsors Resident Scholars to give a presentation to the Upper School student body and meet with classes throughout the day. 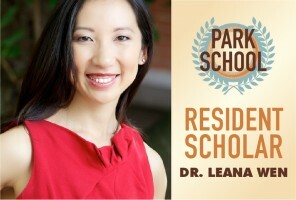 Dr. Leana Wen is the Commissioner of Health for the City of Baltimore. An emergency physician and patient and community advocate, she leads the Baltimore City Health Department (BCHD). BCHD’s responsibilities include maternal and child health, youth wellness, school health, senior services, animal control, restaurant inspections, emergency preparedness, STI/HIV treatment, and acute and chronic disease prevention. Two weeks prior to her assembly at Park, Dr. Wen was named the next president of Planned Parenthood. Dr. O’Neil is the author of the New York Times bestselling Weapons of Math Destruction: How Big Data Increases Inequality and Threatens Democracy. She made the switch from academia (professor at Barnard College) to the private sector, working as a quantitative analyst for the hedge fund D.E. Shaw, and then for RiskMetrics. She left finance in 2011 and started working as a data scientist in the New York start-up scene, building models that predicted people’s purchases and clicks. Dr. O’Neil wrote Doing Data Science in 2013, and launched the Lede Program in Data Journalism at Columbia University in 2014. Dr. Carl Hart is a neuropsychopharamacologist at Columbia University, where he conducts research and teaches undergraduate and graduate courses in neuroscience, psychology, and pharmacology. A key focus of his research is to study the complex interactions between recreational drugs and the neurobiological and environmental factors that mediate human behavior and physiology. As a scientist, activist, and educator, Dr. Hart works with community groups and government officials to bring about more effective drug policies and treatments. Matthew B. Crawford is an American writer and research fellow at the Institute for Advanced Studies in Culture at the University of Virginia. The author of Shop Class as Soulcraft, the New York Times Bestseller, Matthew is now a contributing editor at The New Atlantis - A Journal of Science and Technology. He is also a motorcycle mechanic. Cathy A. Small, Ph.D., Professor in the Department of Anthropology at Northern Arizona University, spoke about the often unconscious ways that culture shapes us and the breakthroughs in insight and perception that can happen in recognizing cultural assumptions. Dr. Perkins, Senior Professor of Education at the Harvard Graduate School of Education, is a "teacher of teachers" and is widely known for his work as co-founder of Project Zero. Perkins devoted one day of his three-day residency to each of the divisions — Lower, Middle, and Upper School. Professor of mathematics at UMBC and author (The Death of Vishnu — a novel long-listed for the 2001 Booker Prize and short-listed for the 2002 PEN/Faulkner Award — about social and religious tensions in India, The Age of Shiva, and "The Seven Circles." Curator in Charge, Department of Photographs at the Metropolitan Museum of Art. Award-winning novelist, biographer, essayist, songwriter, and professor of English at Goucher College. He has written extensively, both fact and fiction, about the history of Haiti. The Philip Franklin Wagley Professor of Biomedical Ethics and Executive Director of Johns Hopkins Berman Institute of Bioethics and Senior Research Scholar at the Kennedy Institute of Ethics, Georgetown University. Dr. Faden is the author and editor of numerous books and articles on biomedical ethics and health policy. Research interests include bioethics and public policy; ethics and cellular engineering; ethics and neuroscience; ethics and bioterrorism; ethics, genetics and public policy; and research ethics; and justice. Adjunct professor in the Department of Physics and Astronomy of the Johns Hopkins University and an astronomer at the Hubble Space Telescope Science Institute. His research interests include theoretical astrophysics, accretion into black holes, neutron stars and white dwarfs, supernova explosions, binary star evolution, and planetary nebula. Author of The Lionheads, Ulysses S. Grant, an Education for Our Time, and All Loves Excelling, Vietnam veteran, scholar and Oxford graduate, who was president of Briarcliff and Hampden-Sydney colleges, superintendent of the Virginia Military Institute, and is now president of the Harry Frank Guggenheim Foundation. Pianist, conductor, and Andrew W. Mellon Chair in Piano at the Peabody Institute. Pulitzer prize winning author of Parting the Waters (America's Civil Rights Movement: Lasting Accomplishments and Unfinished Business). Former Poet Laureate of Maryland, Chancellor of the Academy of American Poets, Distinguished Professor at St. Mary's College of Maryland. Documentary Filmmaker and Academy Award Winner in the Category of Documentary Short Subjects for King Gimp. Presentation: "The Voice of Documentary." Tutor-St. John's College, Annapolis, MD. Presentation: Ursala Le Guin's story "The Ones Who Walk Away from Omelas." Associate Justice, Supreme Court of the United States. Presentation: "On Interpreting the Constitution." Distinguished nature photographer and teacher. Professor and Director, Institute of Human Virology, University of Maryland. Professor of Philosophy, Rensselaer Polytechnic Institute. President of Bard College. Presentation: "The Future of the American High School." Professor of Oncology, Johns Hopkins University School of Medicine. Presentation: "Nature, Knowledge, and Neoplasia." Professor of Conflict Resolution and Public Affairs, George Mason University, Fairfax, VA. Presentation: "Conflict and Change in the Middle East: A Conflict Resolution Perspective." "Reconstructing the Curriculum" Dr. Sara Coulter, Professor of English, Coordinator of Curriculum Integration, Towson State University Dr. Paul Lauter, Professor of Literature, Trinity College, General Editor. Dr. Rhonda Williams, Assistant Professor, Economics, Afro-American Studies, University of Maryland, College Park. Deputy Chief, Science Computing and Research Support, Hubble Space Telescope Science Institute. Presentation: "Frontier Problems in Astronomy." Physician, educator, and editor of the New England Journal of Medicine. Presentation: "Medical Professional Ethics in a Commercialized Society." National Public Radio correspondent. Presentation: "The Secrets, Sins, and Successes of the American Media: An Insider's Perspective." Music Director, The Baltimore Symphony Orchestra. Presentation: "The Art of Listening." Professor of Philosophy, Union of Experimenting Colleges and Universities. Presentation: "Being Good and Acting Well: A Philosopher Looks at the Conflicts Between Private Morality and Public Effectiveness." Professor of Cell Biology and Anatomy, Johns Hopkins University School of Medicine. Discipline: Anthropology. Presentation: "New Discoveries Related to Human Evolution." Professor of History, Princeton University Presentation: "Turning Lincoln's Picture to the Wall: The Shift of Blacks to the Democratic Party 1928-1940." Consultant dedicated to causes of environmental matters, civil liberties, and consumer protection. Presentation: "Do You Count? : The Effect of Grassroots Participation on the Socio-Political Outcome." Assistant Professor, Department of Anthropology, University of Michigan. Presentation: "Adolescent Social Categories: The Development of Workers and Managers in a Suburban High School." Chairman, Department of Landscape Architecture and Regional Planning, University of Pennsylvania. Author of Design with Nature. Presentation: "Human Ecological Planning." C. Douglas Dillon Professor of the Civilization of France, Harvard University. Presentation: "What is Body Language? A Discussion of Cultural Problems in Non-Verbal Communication." Producing Director of Arena Stage in Washington, D.C. Presentation: "The Stage-A Special Place."